Green wood-working and willow-weaving day. Sunday 15th May saw the latest in a line of countryside skills workshops take place on the farm, and proved very popular, with 37 people attending. The workshop was run by Greg Humphries and Kate Beckly, with support from several regular farm volunteers, and was offered free to locals and visitors alike. Workshop under way in the green courtyard. The ethos behind these workshops is to enable people to learn new skills in a friendly relaxed environment, where they are free to come and go as they please and stay for as long as they want, and without the barrier of a set fee (just a bucket for donations). We are only able to do this due to the hard work and commitment of our team of volunteers, who give a lot and expect nothing in return but words of thanks. Learning how to weave a bean-wigwam. Everybody was encouraged to get stuck in and "go with the weave", with hands-on learning of bean-wigwams (to be used on the farm this summer), a willow-hurdle (already in use as a windbreak for the courgettes), a carved wooden spoon, basketry, willow wands and stars, charcoal burning (bags of artist's charcoal are now selling at the farm gate stall for £1.50), and corn-dolly making. Not to mention the obligatory tea and cake! The willow hurdle getting under way. Greg and Toby chuffed to bits with the finished product. Most of the willow used on the day came from our own stands of willow, and was cut during a coppicing workshop back on February 1st. Our next workshop will be raku pottery, this Sunday May 5th, as part of the farm's "Sunflowers and Sundials" event and open day, from 12 till 4pm. As befits our status (and beliefs) as a project linked to the transition movement (www.transitionpenwith.org.uk) we were hoping to work the farm's vegetable strips without the use of a tractor. On January 1st we had the potato strip ploughed (for 48 beds of potatoes) but the other three strips (legumes, brassicas, and alliums) were left alone, and we continued to dig over one bed at a time as and when needed. By this method we managed to prepare and plant 3 beds of broad beans, one of peas, one of chard, one of purple sprouting broccoli, one of garlic, one of shallots, and six of onions (14 beds in total). Each bed took nine hours of labour to complete. However, by late April it was becoming obvious that we needed mechanical aid, or our planting schedule would never be realised on time. On 5th May a local agricultural contractor brought his tractor and plough along and prepared all the strips in 45 minutes, work which would have taken us months by hand. The dock roots and dandelion roots and couch grass roots are all still in the soil though however, and need removing by hand before we can plant or sow, but it is a lot quicker to prepare each bed now than before. The docks can be pulled out of the soil by hand, but the couch still needs digging out. Dock roots uncovered by ploughing. In the three weeks since ploughing, we have prepared 25 beds, allowing us to plant courgettes, squashes, cabbages, leeks, calabrese and cauliflower, and to sow spring onions, carrots, parsnips, beetroot, radishes, scorzonera, sweetcorn, kohl rabi, rocket and turnips. We are moving ahead at the average of ten beds per week, a substantial improvement on before (especially considering the dip in volunteer numbers we are currently experiencing, probably due to "beach weather" having arrived!). Brassica strip before ploughing - quite a daunting sight. 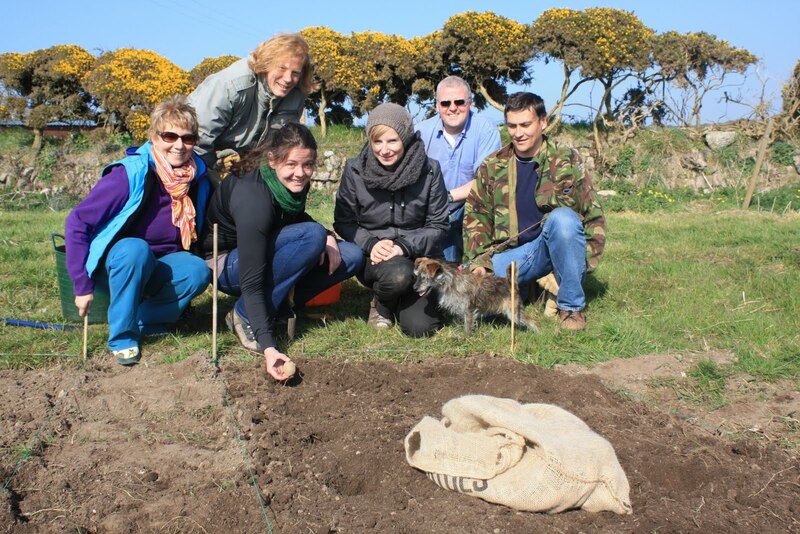 Most volunteer sessions these days involve preparing beds, then planting or sowing into the bed. Yesterday we prepared two beds and planted over 500 leeks, which had been grown from seed in the polytunnel in modules. The vegetable field is looking very different these days, with 90 beds prepared and producing! On Saturday 7th May we had a special volunteering session from 10am till 5pm, to get as much of the new chicken fence up as possible. We are hoping to increase the number of chickens on the farm (there are 48 at the moment) by 100 by early summer, as we are currently unable to meet demand for our delicious organic eggs. The current flock also need a new patch of land to graze and scratch around on, to give their current plot a chance to regenerate. Hugh and Andrew post-bashing while Sonja levels. 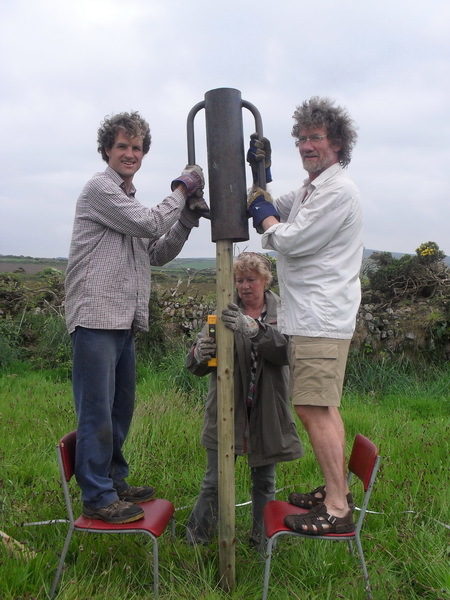 Eight volunteers came along to help, which was a good turn-out, reflected in the amount of work we got done - the two remaining strainer-posts were put in the ground, half the strainers had their support struts constructed, and 100 intermediate posts were bashed into the ground, as demonstrated by Hugh, Andrew and Sonja above. Andrew came along by himself the following Saturday too and finished off all the support struts, so now we "only" need to bash another 100 posts in and we can start nailing the chicken-wire to them! Hoisting a strainer post into position. Always time for tea and cake sat out in the sunshine! Our latest Wildflower Discovery Walk (to be held monthly - watch this blog for details) went well, with three people coming along to learn more about the wildflowers of the area. The sun shone for us, and we walked around the fields, visiting the pigs en-route. Sadly the bluebells were past their prime, but there were more than enough flowers to keep us occupied. I've recently bought "Flora Britannica" by Richard Mabey, the big hard-back edition (thoroughly recommended! ), so can now provide more background and folklore information about the species. Here are some of the wildflowers we found on the walk. Green alkanet - Pentaglottis semperivens. Hawthorn (May) blossom - Crataegus monogyna. Many thanks to Andrea, from Germany, who wwoofed with us for two and a half weeks, and left yesterday to head home. Your help was much appreciated, and we wish you all the best with your new job. We hope to see you again here someday! Andrea on the right, working in the polytunnel. 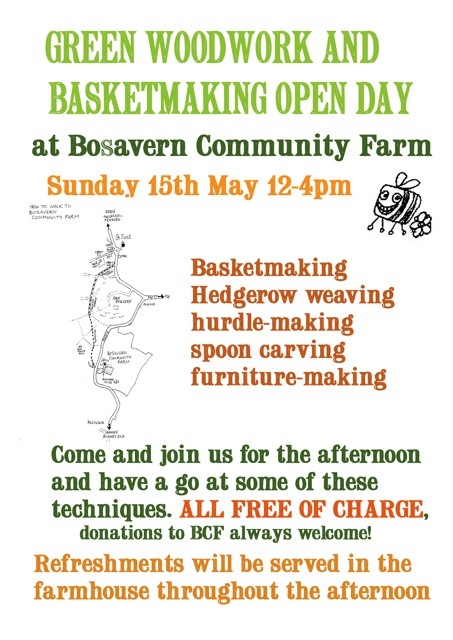 We were surprised from our parsnip-plot-digging this afternoon by a small contingent of staff/interns/helpers from Church Farm in Hertfordshire, who, whilst on holiday in Cornwall, popped in to see what Bosavern Community Farm is all about. 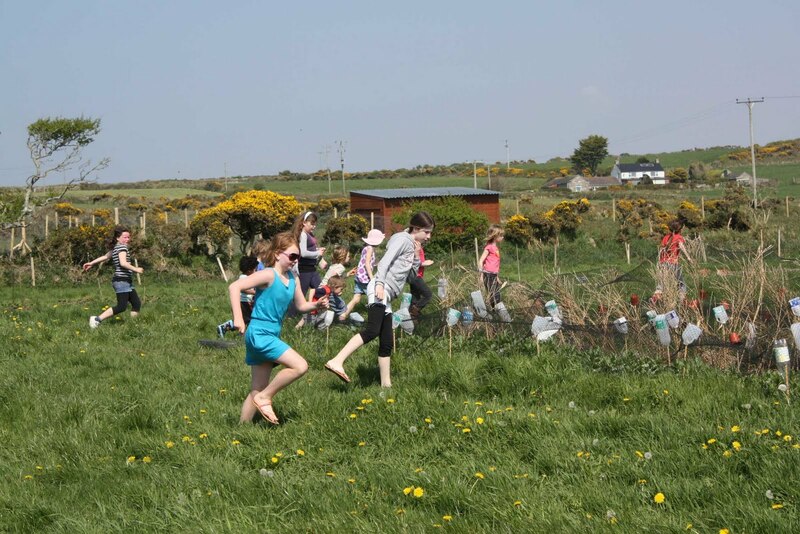 After exploring the polytunnel, vegetable field, tree-bogs, chicken pen, and pig enclosure, they wished us well with the project and went off to find a campsite. 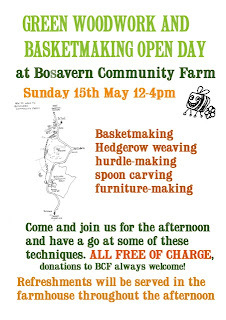 Their flying visit reminded me of my visit to Church Farm last year, and I only hope they found Bosavern as inspirational as I found their farm. Follow this link to their website to find out more - http://www.churchfarmardeley.co.uk. In their Thursday 28th April edition, the Cornishman published two photos of events down on the farm in their What's On pages. Both photos have already appeared on this blog, but here they are again in glorious technicolour! Planting the final potato on March 24th. Egg hunt at the EGGstravaganza, April 17th. Weaving Workshop, May 15th 12-4pm. This coming Sunday there will be a weaving workshop here at the farm, run as an informal drop-in session from 12 noon till 4pm. Attendance will be free, but donations are always welcome to help us cover the costs of the day, and to make future workshops more likely. So whether you fancy a cup of tea and a chat whilst watching weavers at work, or feel like trying your hand and learning new skills, come on down. Wildflower Discovery Walk - to be held Thursday 12th May. On May Eve (Saturday 30th April) Bosavern Community Farm was delighted to host the 23rd annual St Just maypole dance, to celebrate the traditional festival of Beltane. More than 60 people came down to the farm, plus a troupe of folk musicians, with food and drink to share, and a lovely evening was had by all. The festivities took place in Standing Stone Field next to the ancient standing stone itself. After the music and dancing, a fire was lit in the specially-dug fire-pit, and those daring enough leapt over the flames to bring good luck. We are already looking forward to next year's Beltane festivities!